Drought stress adversely affects crop growth and yield. Water availability at critical crop growth stages reduces water losses and improves water use efficiency and yield of a crop. Potassium is a major plant nutrient required in large quantity by crops and has a significant role in increasing crop growth and yield by reducing the adverse effects of drought stress. Although a large quantity of potassium can be found in soil but is mostly in an unavailable form. 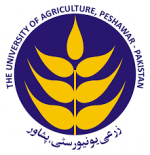 A field experiment was, therefore established at Agronomy Research Farm the University of Agriculture Peshawar-KP to evaluate the response of maize toward different K levels under varied irrigation frequencies, during Autumn, 2015. Randomized complete block design with split plot arrangement was used with a subplot size of 3m × 2m. Treatments consisted of six irrigation frequencies; I0 (no irrigation), I1 (irrigation at V1 stage), I2 (two irrigations; each at V1 and V7 stage), I3 (three irrigations; each at V1, V7 and VT stage), I4 (four irrigations; each at V1, V7, RT and R2 stage) and I5 (five irrigations; each at V1, V7, RT, R2 and R4 stage) allocated to main plot and five levels of potassium (0, 25, 50, 75 and 100 kg ha-1) assigned to subplots. 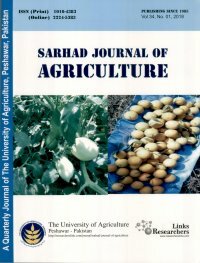 Results exhibited significant effects of irrigation frequencies and K levels on crop growth, yield and yield components. 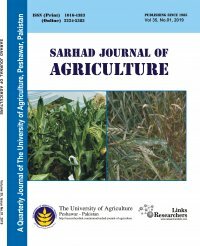 Increasing irrigation numbers substantially increased yield of maize crop and taller plants with higher number of grains ear-1, 1000-grain weight, biological and grain yield, and harvest index were observed in plots irrigated five times. Likewise, 75 kg K ha-1 application resulted in higher biological (plant height and biological yield) and grain yield (grains ear-1, thousand grains weight, grain yield and harvest index) components of maize. Increase in K levels beyond 75kg ha-1 showed a slight decrease in yield. It is concluded that water stress at each critical crop growth stage can drastically reduce crop yield, therefore, five times irrigation each at (mentioned) crop growth stage along with 75 kg ha-1 K is recommended for higher maize production.